Chicago—Thousands of people packed into Daley Plaza on Aug. 14 for the National Moment of Silence. Observed in 90 cities, it was called to respond to the police killing of Michael Brown, an 18-year-old African American, in Ferguson, Mo. Like Eric Garner in New York (see “NYC Police murder Eric Garner“), Brown was apparently shot down for talking back to the police while Black. Protests over his killing were met by days of police riots, including shooting rubber bullets and tear gas at protesters, arresting reporters and trying to shut out media coverage. Observers noted the increasing militarization of heavily armed police departments, who looked like a mostly white occupying army in mostly Black Ferguson. That is a problem, but the greater truth is that the arms and armor only showcase the institutional nature of the police force and the way that many cops think and act. 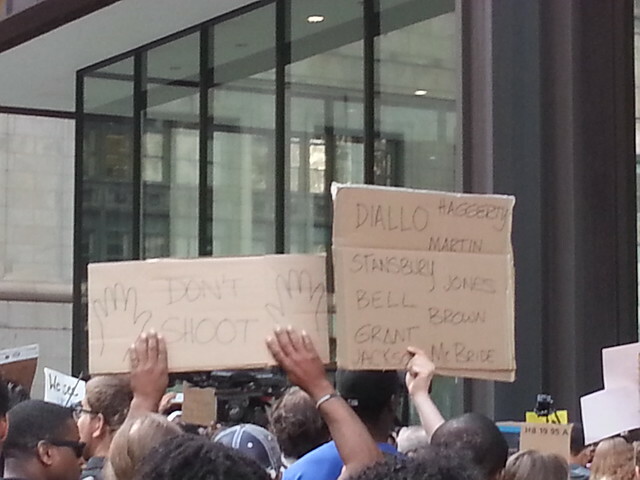 A participant in NMOS14 in Chicago. Photo by Franklin Dmitryev for News & Letters. This was well understood in Chicago, where police harassment and brutality toward Blacks and Latinos is an everyday experience, even when it does not end in murder, as it did with the killing of 22-year-old Rekia Boyd by an off-duty police officer in 2012. 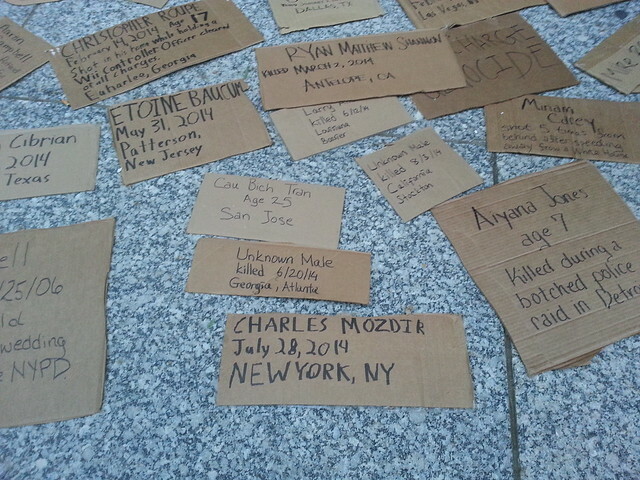 Similar violence in other cities was on everyone’s minds, as shown by the dozens of homemade cardboard signs bearing names of people killed by cops across the country, from Aiyana Jones in Detroit to Kiwane Carrington in Champaign, Ill., from Christopher Roupe in Euharlee, Ga., to Duanna Johnson in Memphis. At 6:20 PM, in time with other events from coast to coast, we observed four minutes of silence—one minute for each hour that Brown’s body was left lying on the sidewalk. During that period we held our hands in the air, each clasping the hands of the people next to us. After four minutes, it was painful. A speaker reminded everyone that people of color, especially young men, routinely have to hold their hands up and hope that is enough to keep the police from shooting them. A little African-American girl lifted in her mother’s arms reinforced our resolve by holding up both her hands with a solemn expression on her face. There were a number of speakers and people reading their poetry, rapping or singing. The crowd was so big and so tightly packed that it was hard to hear. But when we chanted together, it was clear: “Hands up, don’t shoot!” “Black lives matter!” “All lives matter!” And when a speaker referred to Dr. Martin Luther King Jr.’s denunciation of the triple evils of racism, militarism, and capitalism, the crowd roared. It was also clear that, while the organizers were mostly Black, all races were well represented in the crowd. Young people were most numerous, but many middle-aged and old people participated as well. We heard later that there were rallies in five locations in New York City, including thousands who shut down Times Square, and that thousands rallied in Washington, D.C. The rally ended after one hour, but many people stayed to march around the block numerous times and later took to the streets. This article was published together with NYC Police murder Eric Garner, Kansas City for Michael Brown, We march in Oakland for #NMOS14, and Justice for Ezell Ford. This entry was posted in Articles and tagged African Americans, Aiyana Jones, Black liberation, Champaign Illinois, Chicago, Christopher Roupe, criminal injustice system, Detroit, Duanna Johnson, Eric Garner, Euharlee Georgia, Ferguson Missouri, Franklin Dmitryev, Kiwane Carrington, Latinos, Martin Luther King Jr, Memphis Tennessee, Michael Brown, New York City, NMOS14, Police brutality, police killings, Rekia Boyd. Bookmark the permalink.